The NDEx Project maintains a free, public website; alternatively, users can also decide to run their own copies of the NDEx Server software in cases where the stored networks must be kept in a highly secure environment (such as for HIPAA compliance) or where high application load is incompatible with a shared public resource. Dexter Pratt, Jing Chen, David Welker, Ricardo Rivas, Rudolf Pillich, Vladimir Rynkov, Keiichiro Ono, Carol Miello, Lyndon Hicks, Sandor Szalma, Aleksandar Stojmirovic, Radu Dobrin, Michael Braxenthaler, Jan Kuentzer, Barry Demchak, Trey Ideker. Rudolf T. Pillich, Jing. Chen, Vladimir. Rynkov, David. Welker and Dexter Pratt. Pratt D, Chen J, Pillich R, Rynkov V, Gary A, Demchak B, Ideker T.
The NDEx Project is a joint effort of the Cytoscape Consortium and the Ideker Lab at the UC San Diego School of Medicine. Meet the Dev Team! NDEx is also supported by The National Resource for Network Biology (P41 GM103504). NDEx provides a commons where the rapidly expanding corpus of biological network models created by researchers can be shared, discussed, reviewed, and used. It is public forum where biologists can exchange and publish computable network models in many types and formats. One of the goals of the project is to create a home for network models that are currently available only as figures, tables, or supplementary information, such as network models produced via systematic mining and integration of large-scale molecular data. The NDEx project does not compete with existing pathway and interaction databases, such as Pathway Commons, KEGG, or Reactome; instead, NDEx provides a novel, common distribution channel for these efforts, preserving their identity and attribution rather than subsuming them. As with popular file-sharing systems such as Google Docs or DropBox, NDEx users have full control of the content that they upload. In this example, one user has read-only access to a network uploaded by another user. Each user in the system has a home page, analogous to an account on LinkedIn or Facebook. At that page, the user can manage his account and other users can see the information and networks that the user has made public or has shared with them. 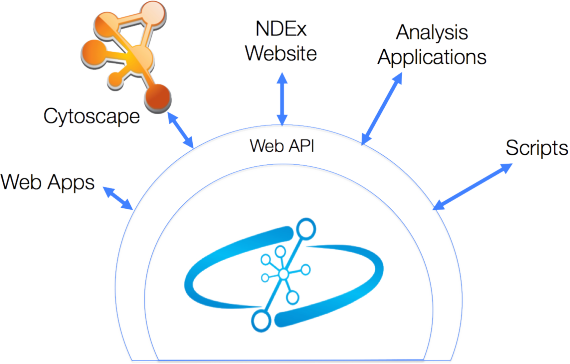 NDEx is based on a REST web API which can be accessed by any application, including the NDEx website and the NDEx Cytoscape App. Lightweight applications and scripts will be able to access and manipulate networks via the NDEx API, making it easy for scientists to develop novel network based analyses. The NDEx project is linked to the Cytoscape team and NDEx is intended to become an integral part of future Cytoscape development. As a first step in integration, the NDEx Cytoscape App enables users to access the NDEx servers directly from Cytoscape, engaging the full range of Cytoscape tools to analyze and transform the networks stored on NDEx. In the spirit of the successful history of Cytoscape plug-ins, The NDEx Project supports the community in the creation of new utilities and analytic tools using NDEx, via code examples, client libraries in multiple languages and developer documentation. 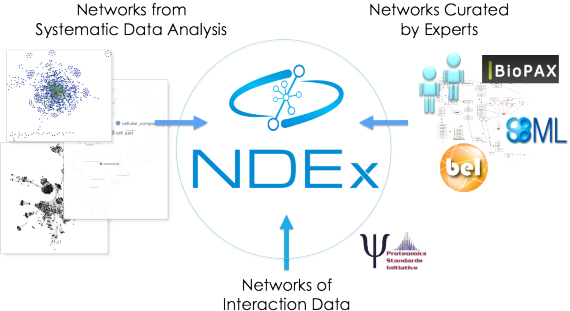 The NDEx platform is intended to enable experimentation with novel forms of scientific review and discourse. NDEx networks are assigned stable, globally unique URIs and can be referenced by publications, by other networks, and by analytic applications. 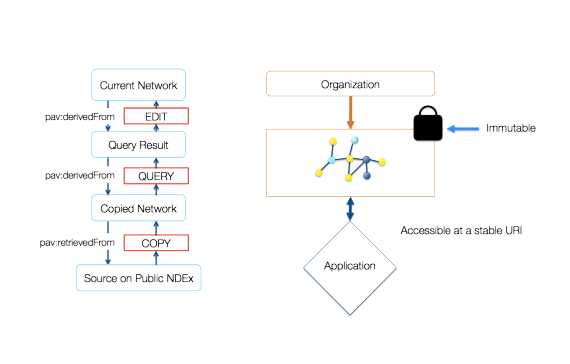 Each NDEx network can include a provenance history structure, enabling applications to record a history of “ancestor” networks and events leading to the network in its current state. 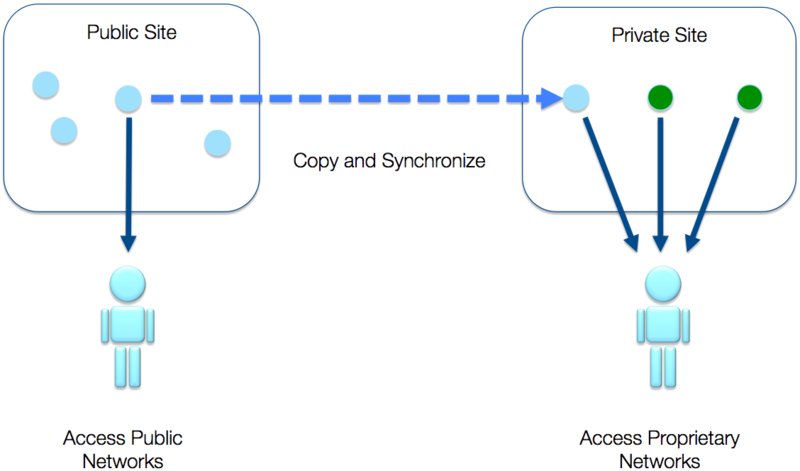 The stability of published content is critical to the scientific process – in order to meaningfully review a published network or to build hypotheses or draw conclusions based on network knowledge, the referenced network must be a constant, immutable entity. In upcoming releases of NDEx, it will be possible to make selected networks immutable, creating stable published versions as durable references. The NDEx server software can be deployed to create a local site, including selected content mirrored from the public NDEx site. This enables the creation of both secure private repositories and local, application-dedicated caches for compute- or storage-intensive situations.